LEWISBURG, Pa. — The United States is grappling with one of its worst-ever drug crises. According to the Centers for Disease Control and Prevention, more than 70,200 Americans died from drug overdoses in 2017, including illicit drugs and prescription opioids — a two-fold increase in a decade. Additionally, 1 in 8 U.S. adults have an addictive disorder. 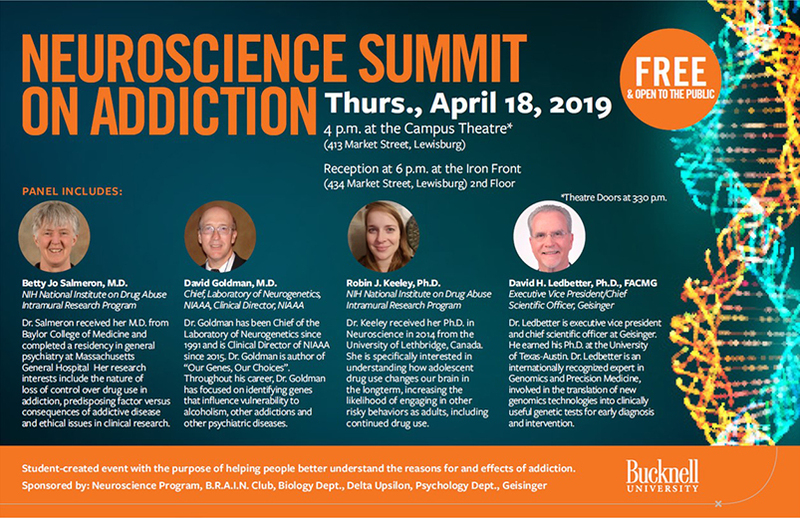 That’s why Bucknell University is hosting a Neuroscience Summit on Addiction featuring five leading addiction research scholars on Thursday, April 18, from 4 to 6 p.m. in the Campus Theatre, 413 Market St., Lewisburg. The student-created event is free and open to the public and designed to help people better understand the reasons for and effects of addiction. A reception will follow across the street at the Iron Front Building, 434 Market St.
David Goldman, M.D., chief, Laboratory of Neurogenetics, National Institute on Alcohol Abuse and Alcoholism (NIAAA), clinical director, NIAAA. Throughout his career, Dr. Goldman has focused on identifying genes that influence vulnerability to alcoholism, other addictions and other psychiatric diseases. Robin J. Keeley, Ph.D. NIH National Institute on Drug Abuse Intramural Research Program. She is specifically interested in understanding how adolescent drug use changes our brain in the long term, increasing the likelihood of engaging in other risky behaviors as adults, including continued drug use. David H. Ledbetter, Ph.D., FACMG, executive vice president/chief scientific officer, Geisinger. He is an internationally recognized expert in genomics and precision medicine, involved in the translation of new genomics technologies into clinically useful genetic tests for early diagnosis and intervention. Betty Jo Salmeron, M.D., NIH National Institute on Drug Abuse Intramural Research Program. Her research interests include the nature of loss of control over drug use in addiction, predisposing factor versus consequences of addictive disease and ethical issues in clinical research. The summit is co-sponsored by the Bucknell Neuroscience Program, Bucknell Researchers, Advocates, and Investigators in Neuroscience (BRAIN Club), Department of Biology, Delta Upsilon, Department of Psychology, and Geisinger.